This year there will be more sales than ever listed. Which means hundreds of locations to explore! With such a high concentration of sites, you’ll need the whole weekend to see it all. Come for preview day on Thursday evening as sellers are setting up their wares. Get a first look at what’s for sale. Review your notes over dinner of fresh Morro Bay seafood before planning out your days on Friday and Saturday to maximize your guilt free shopping. And be sure to stick around Sunday for deep discounts. With a weekend of savings your bound to find something special to take home. Here’s a pro-tip: ditch your car and wear good walking shoes. Continually driving and parking will just slow you down and limit how many sales you can visit – and with free long-term parking around town, finding a spot to park for the day is easy. Try exploring one area on Friday and a different one on Saturday. Just remember to bring shopping bags, baskets, or a cart to carry your finds between stops. Download the Yard Sale Treasure Map app to your smartphone for the complete digital map. It is easy to use and will get you early access - as sales will appear the week leading up to the event. The app also makes it easy to plan your routes. There will also be simplified printed map available for pick up at Tara Lee&apos;s Antiques, Collectibles, and More (248 Morro Bay Blvd., formerly Brenda Sue&apos;s) or at theMorro Bay Visitor Center (695 Harbor Street) starting on the 4th between 10 am to 5 pm. Public parking and restroom maps are also available at the Visitor Center. Be sure to look out for the pink Yard Sale signs to help you spot the sales once you hit the streets! There are over 70 restaurants to try and more than 80 retailers to visit. The 6th annual The Rock community radio fundraiser Saturday night (April 6) is a great way to unwind from the yard sale. Swing by the Morro Bay Vets Hall, 290 Surf Street. Doors open at 5:30 pm and the band, Unfinished Business, starts at 6:30. The Rotary Club is also hosting an all-you-can-eat Crab Feed Fundraiser Saturday night at the Morro Bay Community Center, 1001 Kennedy Way from 5:30-7:30 pm. 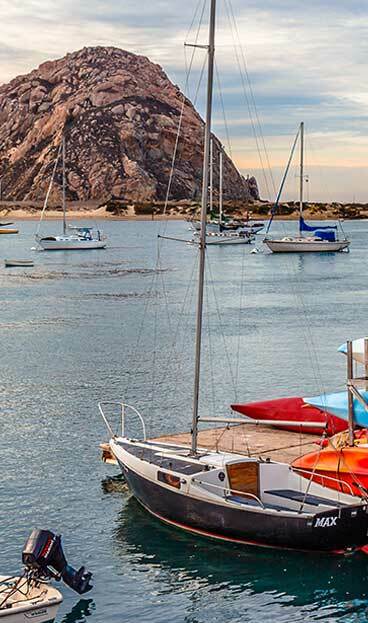 When staying overnight at one of the hotels or motels in Morro Bay you will receive our Spring Savings booklet with over $150 in shopping, food, and activity savings around town. See more of the city, the harbor and the bay, with savings on whale watching tours, fishing charters, kayak and bike rentals. These discounts are the perfect excuse to take a break from the Yard Sale and make some quintessential Morro Bay memories. Now’s the perfect time to book your stay!